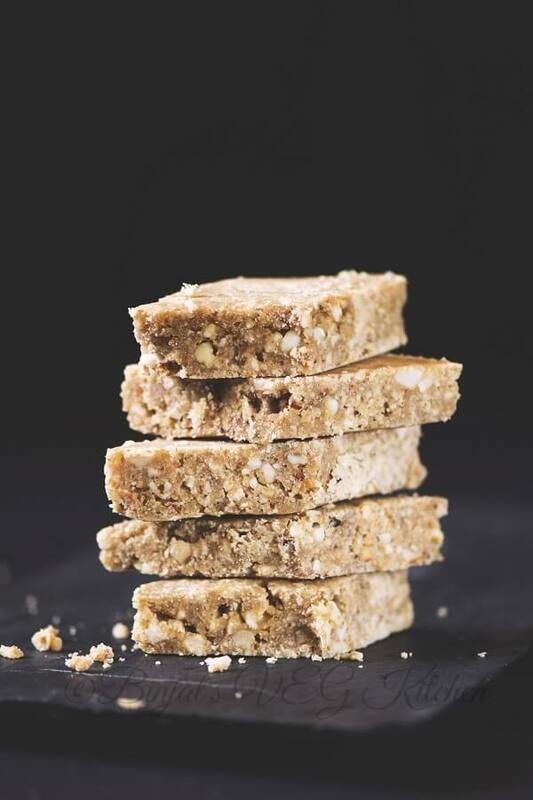 Peanut Flax Seeds Powder Bar (Chikki), or you can also call this health bar because of Flax Seeds and Peanuts. This mouthwatering soft Peanut Flax Seeds Powder Bar is vegan, gluten free, and tastes awesome. This Peanut Flax Seeds Powder Bar recipe is simple to make, and a great way to make a healthy peanut-flaxseed bar. 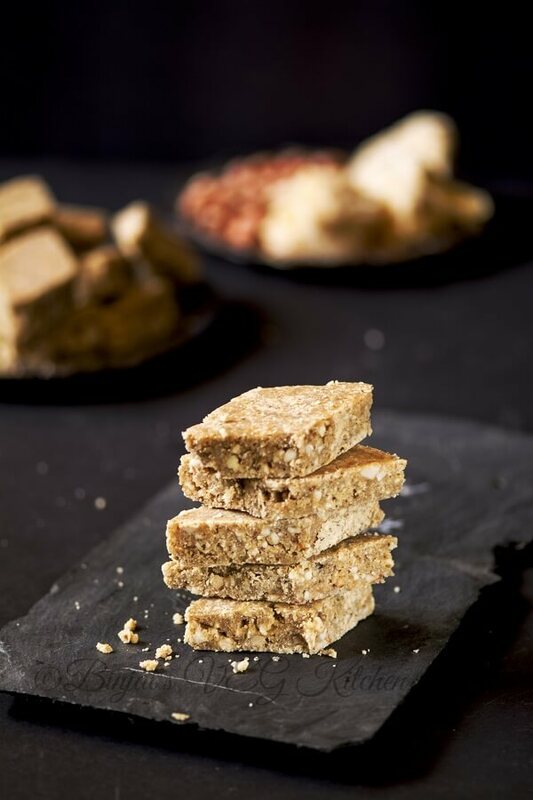 Homemade Protein Bars are easier to make than you think and much tastier too! Flaxseeds contains high of protein, dietary fiber, several B vitamins and dietary minerals. Flaxseeds are especially rich in thiamin, magnesium and phosphorus. On the other side, peanuts are excellent source of several B vitamins, vitamin E, several dietary minerals, such as manganese, magnesium and phosphorus, and dietary fiber. They also contain about 25 g protein per 100 g serving, a higher proportion than in many tree nuts. Currently weather is very changeable, one time its hot and other time its cold, which makes kids sick. In such a season, Peanut Flax Seeds Powder Bar is very good for kids as it gives heat to body with essential nutrition. 1. Dry roast the peanuts in a pan on medium heat, stir continuously for about 6 to 7 minutes until golden brown. 2. Remove from the pan, wait till they cool down, and then rub between your palms to remove most of the peanuts skin. 3. Now coarsely blend it in a blender for 2-3 seconds and keep a side. Do not make a powder form. 4. Grease a plate or wide dish with sides and keep aside. 5. Wipe the same pan. 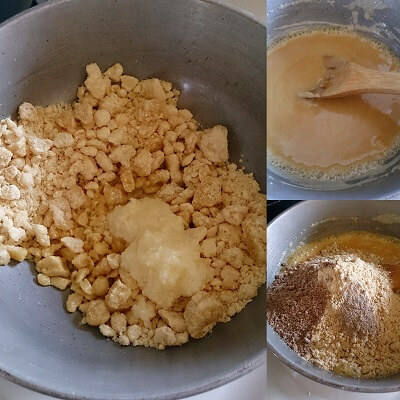 Add grated jaggery, ghee, water and mix well, cook till a thick syrup is formed and start bubbling from sides. 6. Once its start bubbling, then add coarsely grounded peanuts, flax seeds powder, ginger powder, cardamom powder and mix well. 7. Pour the mixture into the greased plate and spread it evenly with help of steel bowl (apply little ghee on bowl, it helps to avoid sticking) for spreading the mixture and make a plain/smooth surface. 8. Let it be slightly cool, then cut into a desired shapes as per your choice. 9. Now cool it down completely and store it in a container. • You can store it up to 10-15 days in kitchen shelf without a refrigerator. • You can skip ghee for making this bar. 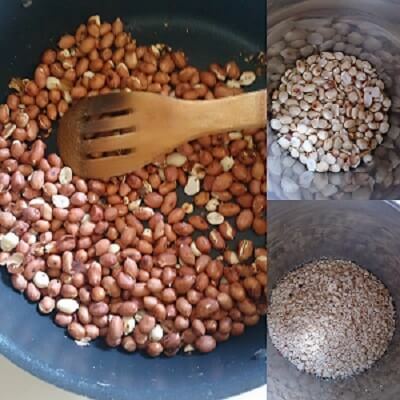 Dry roast the peanuts in a pan on medium heat, stir continuously for about 6 to 7 minutes until golden brown. Remove from the pan, wait till they cool down, and then rub between your palms to remove most of the peanuts skin. Grease a plate or wide dish with sides and keep aside. Wipe the same pan. 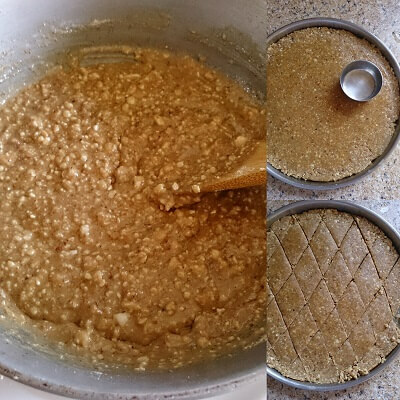 Add grated jaggery, ghee, water and mix well, cook till a thick syrup is formed and start bubbling from sides. Pour the mixture into the greased plate and spread it evenly with help of steel bowl (apply little ghee on bowl, it helps to avoid sticking) for spreading the mixture and make a plain/smooth surface. Now cool it down completely and store it in a container. You can store it up to 10-15 days in kitchen shelf without a refrigerator. 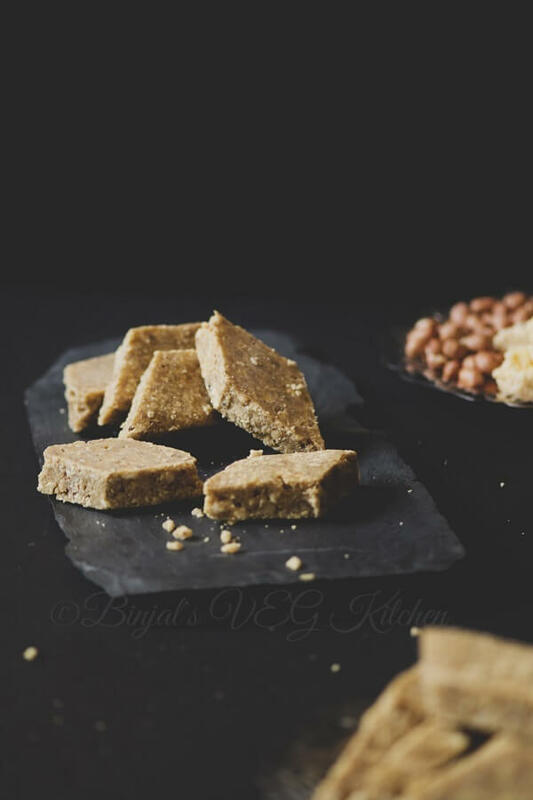 You can skip ghee for making this bar. The photos are mouth watering. I was looking for grain free energy bar recipes and will try to make this one. BTW any tips on how to take such great photos with dark background? Thanks Veggie Sutra! click on natural light and use black background and block one side light and create contrast. it will helps you! These bars look great and very nutriious. I am a big fan of flax. 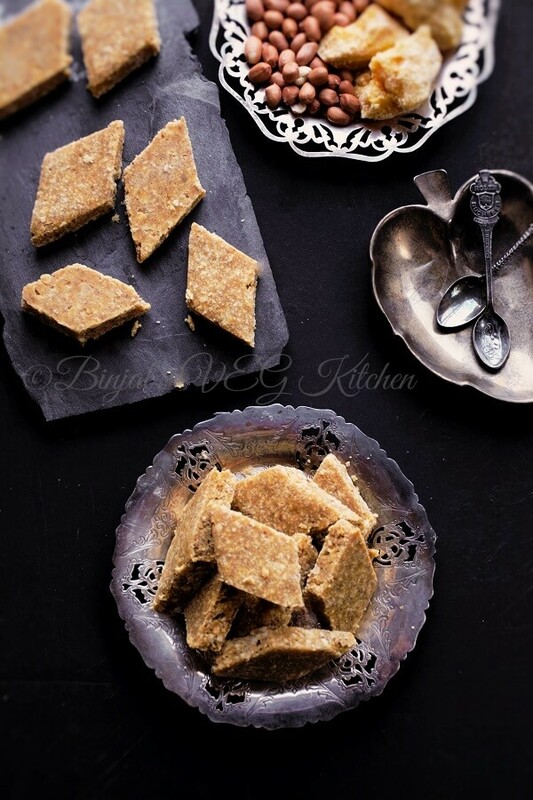 I am intrigued by jaggery and would love to try cooking with it. I love the combination of flavors! I have yet to cook with jiggery, but love to try new things. Beautiful photos! I love the combination of flavors! I have to cook with jiggery, but love to try new things. Beautiful photos! I love the combination of flavors! I have yet to cook with jiggery, but I love trying new things. Beautiful photos! This looks like an excellent recipe. Cardamon has become my favorite ingredient to cook with. How would it taste with a slight bit of honey? I love that these bars have jaggery and no sugar and with the cardamom and ginger I bet these were so aromatic! I cannot wait to try these! I love peanut chikki’s and the addition of flaxseed powder made it even more healthy. Delicious! They look delicious! Can I substitute ghee with coconut oil? I love all that peanut flavor and the good for you stuff, these bars are a powerhouse for sure! Yum… i love peanut! This recipe looks delicious and easy to follow! Such a cool recipe. I love how healthy these are for you!